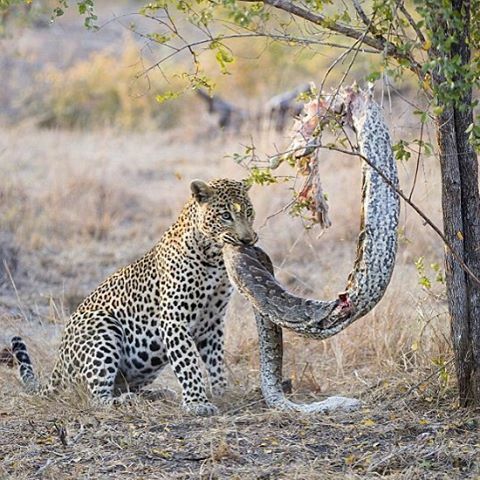 This is something I've not seen before, a leopard eating an African Rock Python! And a massively large python at that! Obviously the leopard can move a bit faster than the snake so it would seem he had the advantage but we can only imagine the tussle that went into bringing the snake down. Perhaps the snake had died of natural causes? It was suggested that this photo was taken in Yala National Park, Sir Lankia, however the snake appears to be an African python. Leopards are actually known to be quite tough buggers - they can kill crocodiles with a bit of effort! And whatever you do, never try and corner a leopard, they will tear your scalp off!